With the patience of a Jedi master, writer-director George Lucas waited sixteen years before determining the time was right to launch his much-anticipated Star Wars prequel, The Phantom Menace. Stepping back into the limelight to personally shepherd the project through its four-year production odyssey, the visionary filmmaker shares his insights on the most ambitious effects movie ever made. An enormous conceptualization effort, headed by design director Doug Chiang, lent form and substance to Lucas' imaginings of The Phantom Menace's fantasy worlds. Initially comprised of just Chiang and another illustrator, the team eventually expanded to include 17 artists, pumping out endless sketches, paintings, sculptures and models in the Skywalker Ranch art department. Fittingly, it was Industrial Light & Magic, the much-honored company established by Lucas to produce the revolutionary effects in Star Wars, that would undertake the staggering task of bringing his latest opus to fruition. For The Phantom Menace, ILM would pull out all the stops, calling upon both veterans of the earlier trilogy and a newer generation of digital devotees to advance the art of visual effects to dizzying heights. 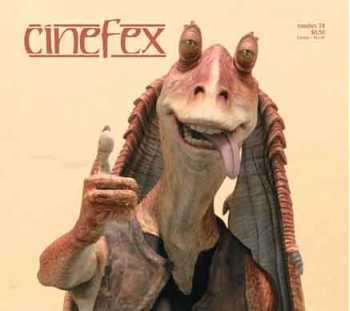 Although computer animation would play the more prominent role in populating The Phantom Menace's alien worlds, hundreds of whimsical characters - both background and principal - were constructed for on-set use by creature creator Nick Dudman and his crew of animatronics and makeup specialists.